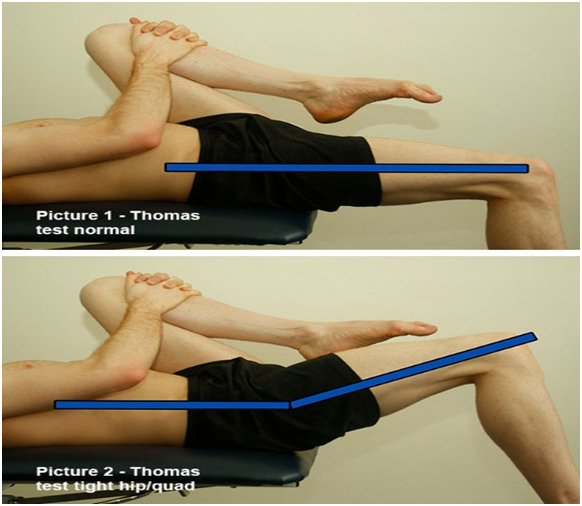 The Thomas Test is a quick and simple assessment tool that can help determine if hip flexor tightness is present. To perform this test lay on your back at the edge of a mat and pull both knees towards your chest as far as you can go. Keep one knee held in towards your chest and let the other leg drop down. The leg that you drop should be parallel with the mat, or lower. If the leg that you dropped does not achieve this position you may have tight hip flexors. Further assessment by a physical therapist can help determine exactly which structures are too tight or weak and help you develop a plan of appropriate stretching and strengthening exercises to achieve proper muscle balance. ← What is Bursitis? How can PT help?